There's a thin line between normal and insane. I think I'm standing on it… which would explain the big blob of crazy on my shoe. A group of approximately six parents picketed outside Hawkins Elementary School to protest the fact that 4th grade science teacher, Veleka Setsor, is still in the classroom. (More photos here) Setsor was charged last week with aggravated assault following an argument with her 18-year old daughter. The Hawkins County school system, in compliance with Tennessee state law, is conducting an investigation into the matter. Until the issue is resolved, an aide has been placed in the classroom with Setsor. Inside the building, things seemed to be business as usual. Principal Barry Bellamy said a few of the children had noticed the protesters, but it didn’t seem to be creating a problem. I’ve also talked to protester organizers, Kim Moore and Robin Robinson, neither of which have children in Setsor’s class. According to the women (I’m paraphrasing here) everyone from Phil Bredesen to Jesus himself has promised to come and rain hell down upon all those who cross them. Um, yeah. Those sources (well all of them except for Jesus) deny making statements. a) News reports, such as the report on Setsor, come primarily from police reports. Police reports, particularly in assault cases, rely heavily upon the victim’s statement. I also realize that Tennessee is a “preferred arrest” state and the law is here. b.) The county must follow state laws tenure laws: which are here and here. The local policy is modeled after those laws. 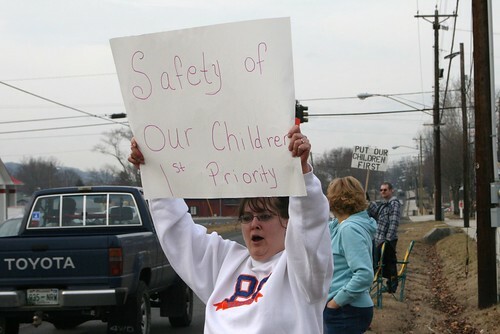 c.) I don’t feel my child is in danger at Hawkins Elementary School. At all. Period. Jeff Bobo has an excellent video report covering the HES demonstration here. This entry was posted in Crime Court and things involving lawyers category, Hawkins County, In the news and tagged activism, classroom, Hawkins County, Hawkins County Elementary, Hawkins County Schools, parenting, Parents, picket signs, protests, Teacher Tenure, Veleka Setsor. Bookmark the permalink. I am a mother of a 4th grader who is in this teachers class. The day I found out about this I immediately sent email to the priciple and the school board letting them know that I do not want this woman around my child. I recieved a call from the principle explaining to me that they had placed an assistant in the classroom with the teacher at all times and if the assistant would for any reason need a break that he him self would go into the classroom. He said that he could not bring her personal life into the school but my feelings on that is that it is no longer personal when it was put out in the paper and parents found out what kind of things go on in the teachers lives. Everyone knows that if this was a kid doing this outside of school he would have been suspended until they finished the investigation and determined if the child was safe to be at school. It is bad enough to know that we take a chance everyday sending our kids to school with other students shooting each other but now knowing that a teacher can pull a rifle (even a pellet rifle can hurt) on another human being and the school is basically saying it is OK. I was told that because this was a 18 year old that it was different. How the heck is it different when it is still another human being and it is her child? If she can do this to her child what can she do to mine or some of the other students? I mean can they gaurantee that she is not bringing a gun to school….NO they cant because they dont have metal detectors. Do they have someone searching her to make sure she has no gun…I doubt it. I mean come on…all it takes is a small gun to kill someone and no human is safe from that. Not even an assistant!!!!!! To me they are sending a message to these kids saying it is OK for the adult to do it but not for the kid….I am sorry but I am very upset about this and cannot believe that she has not been removed from her teaching position until this is over. She was recorded saying she would kill her daughter as well as admitting she did have a rifle so what more do they need to be convinced that this woman is a danger. I am very fearful sending my daughter to school each day in fear of what might happen. I dont know what to do about this. I will tell you this…If I had known that they were picketing today I would have been there right beside them. I plan to be at that School Board meeting tomorrow and I will not be afraid to stand up and say my peace for the sake of my child. We send our kids to school each day thinking that these teachers will protect them and keep them safe….I am not so sure that they realize what they are doing in this situation. I can honestly say Home Schooling is looking better and better each day. I was quite disappointed with the tv news reporter that I spoke with on Wednesday morning. I spoke with him after personally speaking with Mr. Bellamy. I told of how accomodating Mr. Bellamy was regarding my concerns. Mr. Belamy spent 30 minutes out of his busy scheduel to talk with me & my daughter to reassure us that he is doing eveything that he can to always keep the children safe. Counseling support was also offered, if needed. However, the only part of my story that the news reported was that my daughter was frightened a bit after learning what had happened. The reporter, for what ever reason, did not deliver the rest of our story. I think best thing that we can all do is pray for the Setsor family, the faculty and the students. After all, God does know best! !